Suruchi Parakh’s name is synonymous with great designs at amazing prices. Every season her designs just get better and better and yet brides have the wriggle room to choose their outfit without burning a hole in their pocket. Latest Suruchi Parakh Lehengas is no different. There are some amazing new styles for brides, bride and grooms sister and family for every occasion. The trends in wedding fashion off late is all about pastels, ruffles, feathers in elegant simple designs. But while most designers have something specific to offer in those categories. Suruchi Parakh goes a step further by mixing it up to give you unique one of a kind look for your wedding. How Much Do Latest Suruchi Parakh Lehengas Cost? Suruchi Parakh lehengas typically range between INR 20k to INR 40k. Most of the lehengas in this post will be in the price range of INR 20k to INR 30k. Heavy lehengas go upwards INR 30k. I am sharing some of the lehenga prices under the pictures in this post. If you wish to know more about Suruchi Parakh Lehenga prices. Check out my previous blog posts about the designer. I always say florals can never go out of style. There is just so many variations to florals. You can do pastels to pop. I love how designer Suruchi Parakh has used florals with that gorgeous ruffle sleeved lehenga blouse. A classic mint blue pink, who doesn’t love that. If your budget permits, get this for your bridesmaids, and have a fun outdoor photoshoot. For bridesmaids, you want to pick out something that is quintessential pretty-pretty. Something that your girlfriends will instantly love and have a use of post wedding as well. 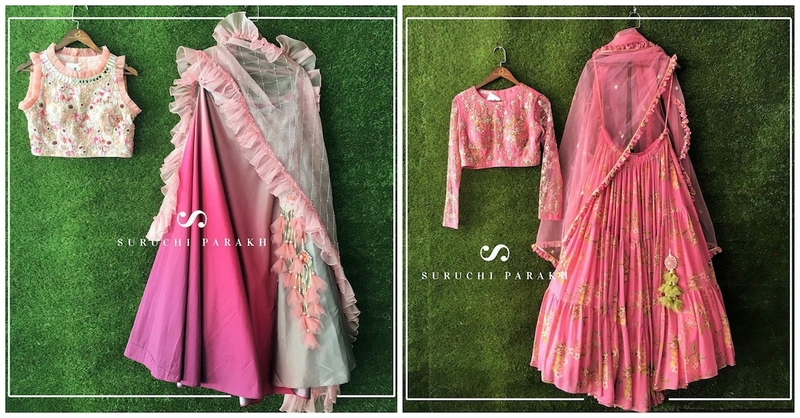 I absolutely love these three lehengas by Suruchi Parakh. They are simple, elegant and have one distinctive feature that sets them apart. Be it the jazzy dupatta, or the blouse design, they are easy to carry and look super cute. A sister of the bride/groom has to shine in all of the wedding functions. She is the cynosure of all eyes, and quite frankly the life of a wedding. If you are looking for a stand out lehenga, I recommend this gorgeous red rose lehenga that’s bright with its pop colour. But the simple dupatta and blouse give it the right balance. You can opt to wear this for a mehendi or sangeet night. What I love about this design is you can easily mix and match this even after the wedding functions. The dupatta is simple and can be reused with any traditional Indian wear outfit. The skirt on the other hand, you can wear with a casual top or crop top on any of brunch, or ethnic wear party in your house. If you want to want to do a twinning style at any one of your wedding functions, this is a gorgeous modern yet traditional outfit to go for. The chunky latkans and the beautiful mirror work printed lehengas is not too OTT and yet makes the right statement. Banarasi Skirt Paired With An Elegant Banarasi Dupatta. In the Latest Suruchi Parakh Lehengas, I found this gorgeous banarasi lehenga that I know most of you’ll have been looking for. Banarasi Lehengas have been in trend for awhile now. The classic combination of blue and pop pink looks royal in this ensemble. It’s fit for a morning wedding function. Banarasi looks amazing in pictures. So this would be my recommendation for either a puja or the main wedding function. One of my favourite lehengas from this collection. This gorgeous red pink the dye lehenga is the perfect pre-wedding lehenga on budget. I think you can easily wear this for your morning mehendi function. Dance, twirl, this lehenga won’t disappoint you. This lehenga is close to my heart ❣. @mansavee , who’s our very regular client once came to us saying that there is a very special event that she has to attend and she wants to make something really different and unique. We made something that she would cherish for life. A love story I personally fell in love with. Personalise your outfits on order. Suruchi Parakh also does some amazing bridal lehengas. Custom bridal lehengas that is. You might not see a whole lot of bridal wear on her Instagram page. But connect with the designer if you like her design style. Full sleeve blouses are back in trend. This one in particular is a gorgeous heavy embroidered lehenga blouse in a pretty maroon shade. For your first set of pre-wedding functions, something like this is an elegant choice to go for.